Sony BDP-S4500 review | What Hi-Fi? Sony doesn’t seem capable of making a bad disc spinner these days. 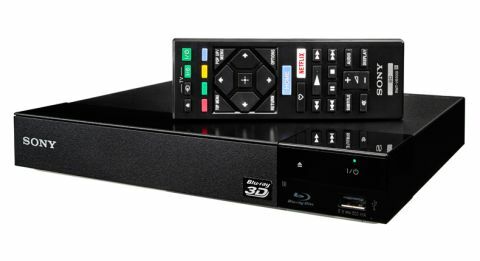 2014’s models were magnets to five stars, and it only took one of its 2015 Blu-ray players (the BDP-S5500) to reopen the floodgates for praise. Here is its little brother – no doubt one of the cheapest players we’ll see this year – and again we have to delve deep into our bank of superlatives. The spec drops built-in wi-fi (a direct Ethernet connection opens the doors to its network features instead), but 3D, DLNA and smarts remain part of the package. The XrossMediaBar has been ditched for a cleaner, simpler one, although traces of it still hang around in the set-up menu. That means you don’t have to faff with navigating longwinded menus. Instead, your apps and services are conveniently in one place. The new players have adopted PlayStation Video – formerly Video Unlimited – where you can purchase tons of TV shows and movies, while Amazon Instant Video, Netflix, BBC iPlayer, Demand5 and YouTube are all on board. Favourites can be added to the home menu with just one button press, and the half-size remote is identical to last years save for a new Netflix logo on the shortcut button. It is perfectly good to use, though Sony’s slick and intuitive TV SideView app (available free on Android and iOS) can step in as a controller for the BDP-S4500, too. Like the BDP-S5500, it’s the size of a photo album and takes a no-frills, square-box approach. Sony has reigned in the quirkiness of last year’s Quartz design, and its smooth matte plastic is smartly decorated with strips of gloss and the odd brushed metal effect here and there. You still get a USB input on the front, and around the back is the usual HDMI output and a coaxial for alternative hook-up to your AV receiver. Sony has worked hard to improve boot-up and loading times from last year’s models with its Quick Start Mode. It claims you get a picture in ‘less than one second’, and isn’t bluffing. As soon as your finger leaves the power button, there’s barely time to blink before the home screen appears. It doesn’t hang around when loading discs either, guaranteeing a picture within 10 seconds. We pop in Interstellar Blu-ray, a stonking disc for testing motion and contrast, and the Sony lays its talents bare. Black seatbelts against white spacesuits can be merely pixels apart and both will look striking. The lights on the control panel are bright and defined in the dimly lit cockpit. As the spaceship flies past extra-terrestrial landscapes, both remain clear and stable. Sony hits the bullseye when it comes to colour reproduction. Whether it’s orange hair, green crop fields, or the rare splashes of colour inside the spaceship – red life jackets, panels on helmets – hues are rich and robust. The picture is layered with fine detail, making the BDP-S4500 one of the most revealing sub-£100 players. Suits are textured, while intricate facial details are visible even through the helmet glass. With The Hobbit: Battle of the Five Armies on DVD, whether it’s close-ups of bearded dwarves or panoramic sweeps of mountains, the Sony flags up the insight and crispness that rivals can’t touch (though the Panasonic DMP-BDT170 comes very close). The Sony grants the film’s thunderous score all the trepidation and drama that Hans Zimmer intended. Pipe organs ring through with power and authority, and frenzied piano playing is agile and dynamic. Each bell chime in the quieter moments is nicely precise, while explosions have clout. It makes a very convincing case a budget CD player too. Its musical presentation is full-bodied and cohesive, lathered with punch and rhythmic energy. Nothing’s perfect, but the BDP-S4500 comes very close. Delivering on every count, it’s a positive steal.